Mercedes have been producing an SL (Sport Leicht) model or range of models since 1954 when the landmark 300SL was unveiled. The similarly styled, but mechanically unrelated, 190 followed in 1955, completing the first generation of cars. Their successor was the W113 series SL, which proved to be more comfortable than the former and faster than the latter (a point emphasised by Eugen Bohringer's 1963 Liege-Sofia-Liege rally victory). The last of the W113 line, the 280SL, was launched in 1968. Blessed with the same effortlessly elegant Paul Bracq styling as its earlier siblings, it was powered by a new seven-bearing crankshaft 2781cc straight-six engine that developed some 170bhp and 180lb ft of torque. Equipped with all-round independent suspension and ATE disc brakes, its 'square' track gave notably sure-footed handling. Able to blur the divide between city streets and open roads with ease, the majority of 280SLs were specified with four-speed automatic gearboxes and power assisted steering. The SLs were available in Californian Coupe, Convertible or Coupe Convertible guises, the last of which came with both a soft-top and the famous 'Pagoda' hardtop roof (so called because of its gently scalloped centre section). 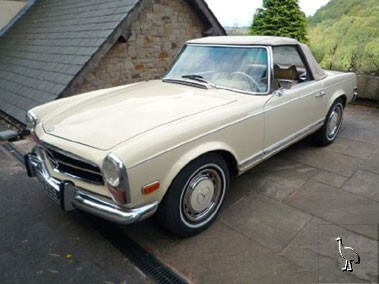 This left-hand drive 1971 280SL was owned by the Sarasota Classic Car Museum in Florida for some nine years, where it rubbed shoulders with the likes of John Lennon's psychedelic Bentley and Paul McCartney's Mini Cooper. Once blue, it has been resprayed white at some time in its life and the interior retrimmed to match in cream leather with blue piping. The last owner apparently added few miles and the car has recently benefited from a full mechanical service, new brakes, spare wheel etc. Reputedly garaged throughout its life, it is said to be a "rust free example" with "very good" or "good" coachwork, paintwork, interior trim, engine and automatic transmission. 'DDG 959J' is taxed until the end of July and comes complete with some history.